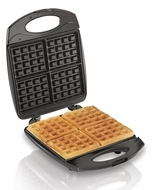 Enjoy delicious fluffy waffles with the Hamilton Beach Belgian Style Waffle Baker. Made of premium stainless steal and nonstick grids, it's designed to make perfectly baked waffles every time. It's compact design makes for easy storage when not in use.